Would you like to spend an hour and a half listening to English actress Charlotte Rampling talk about her life and career? Certainly as far as acting careers go, hers has been one of the more interesting. Rampling has always steered clear of the kind of films most people regard as “entertainment”, preferring instead to tackle complicated and controversial parts, often with strong sexual overtones. Among Rampling's credits is THE NIGHT PORTER, a movie in which she plays a woman who had been imprisoned in a concentration camp during World War II. After the war, she winds up resuming a relationship with one of the guards. In MAX MY LOVE, her character falls in love with a chimp. Probably her most mainstream roles were in Woody Allen's STARDUST MEMORIES and Sidney Lumet's THE VERDICT, but these are the exceptions. She continues to play the kind of rich leading roles most actresses would kill for well into her sixties, notably in a pair of films for Francois Ozon; UNDER THE SAND and SWIMMING POOL. Rampling discusses most of these films and their effect on her personally at some length in segments dealing with various relevant ideas like “exposure”, “taboo”, “demons”, and “death”, to name a few. 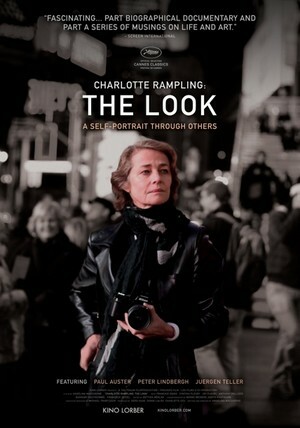 Rather than being a traditional interview, each segment features Rampling in conversation with friends and past collaborators who facilitate her musings. And while we do learn enough about Rampling's personal life to know it's probably every bit as interesting has her films, she only gives up so much. If you're a fan of Rampling's, you'll probably enjoy hearing her talk about her work and the sort of things that motivate her to make certain choices. Even if you're not familiar with the subject, Rampling is an interesting enough person that you may stillwant to hear what she has to say. But does THE LOOK work as cinema? Sort of, I guess. It's nice to see film clips and photos from the films and artworks Rampling discusses, and director Angelina Maccarone tries to find interesting locations for Rampling to have her conversations. There's only so much you can do to make people talking for an hour and a half visually interesting, though. Combined with Rampling's reluctance to really open up, the result is a documentary that, unlike the work Ms. Rampling is best known for, intrigues but doesn't fully satisfy. 2 1/2 out of 4 stars.